Apple Touch review | What Hi-Fi? 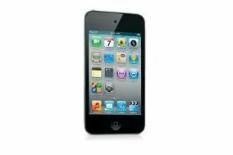 The third generation iPod Touch was a desirable, intuitive and, to a large extent, unrivalled portable media player. The fourth generation is slimmer and neater-looking around the edges. Battery life is around 40 hours for music and seven for video playback, compared with 30 hours and six hours before. Front and rear-facing cameras are also included, along with the ability to hold video chat with another Touch or iPhone 4 user, over wi-fi. But the big news about the tweaked Touch is the inclusion of Apple's 3.5in Retina display and LED backlight, similar to that found on the iPhone 4. The fourfold increase in resolution means menus now appear super sharp and ultra clear. Video playback benefits too, as whites are punchier and edges are show greater definition. Blacks aren't quite as deep or rich as they could be, but the Touch unearths a good level of low-light detail. Fitting all the electronic bits and pieces in that slimmer chassis hasn't affected sound quality either. In fact, the fourth generation Touch sounds marginally better, although it's a shame that Apple still insists on supplying poor in-ear headphones. Use something suitable such as the Award-winning Beyerdynamic DTX-80s and you'll hear that the Touch is now capable of extracting an ounce or two of extra detail. The overall presentation is a little sharper and more precise. The Klaxon's Gravity's Rainbow sounds energetic and foot-tappingly entertaining. The enthusiastic drum-play rolls along at speed, but the Touch displays excellent control too. Everything is held together by the operating system and iOS4 software. Navigating your way round the device is as easy as ever – the Apple's touchscreen makes rival devices seem cumbersome. Add into the equation user-friendly iTunes software and all the arsenal of music, videos, and apps it brings to your disposal and you don't really need to look elsewhere. This is a first-class portable media player.